MANILA — The first two years of the Duterte presidency have been without a shortage of controversies. Endless allegations of human rights abuses related to its bloody drug war and recently its oppressive anti-tambay campaign (both targeting the poor) continue to face the administration. 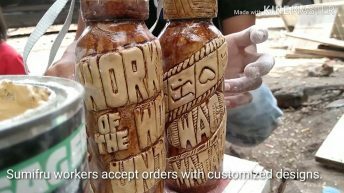 Tyranny has reared its ugly head as President Rodrigo Duterte placed Mindanao under Martial Law and intensified the militarization of the rural areas. 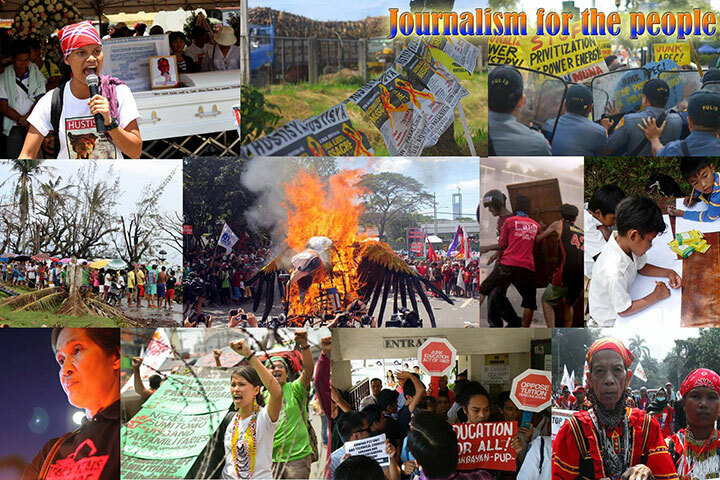 Extrajudicial killings that target activists, journalists, and even local politicians are on the rise amid a reign of worsening impunity. 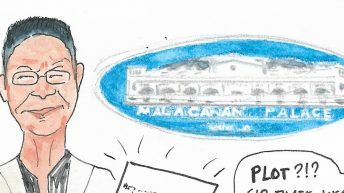 Its push for federalism through Charter change (Cha-cha) is widely seen as an attempt not just to perpetuate the current regime but to concentrate further political power in the hands of Duterte and his clique. 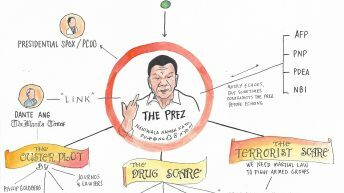 With deepened control over Congress, Judiciary and the military through patronage, harassment and a combination of both, and with the backing of both the US and China, Duterte has been laying the groundwork for an authoritarian rule not unlike the Marcos years. 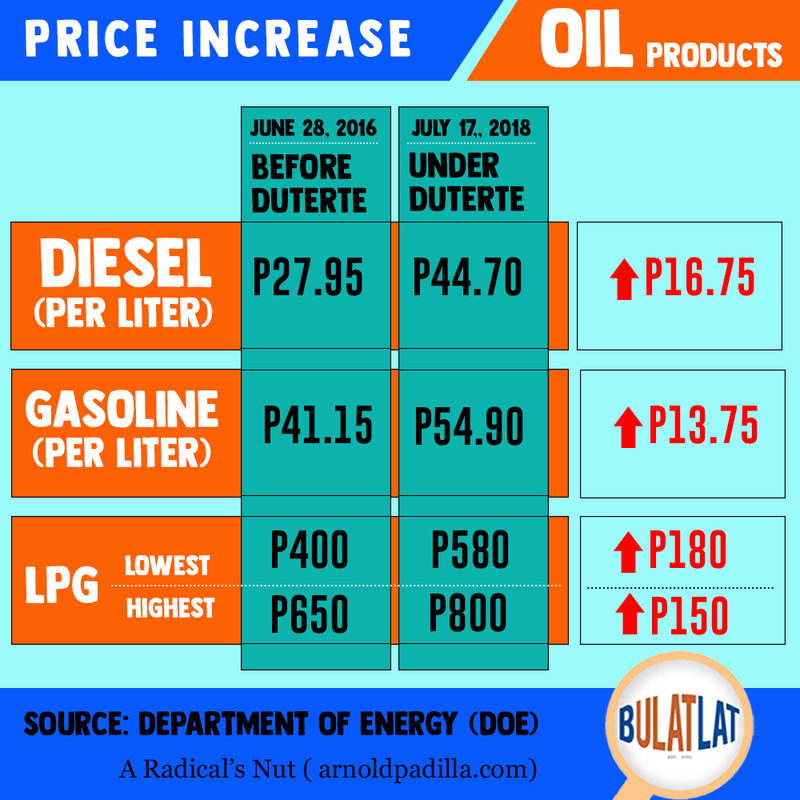 The price of diesel under Duterte has already increased by almost 60 percent; gasoline by more than 33 percent; and LPG, by 23 to 45 percent. 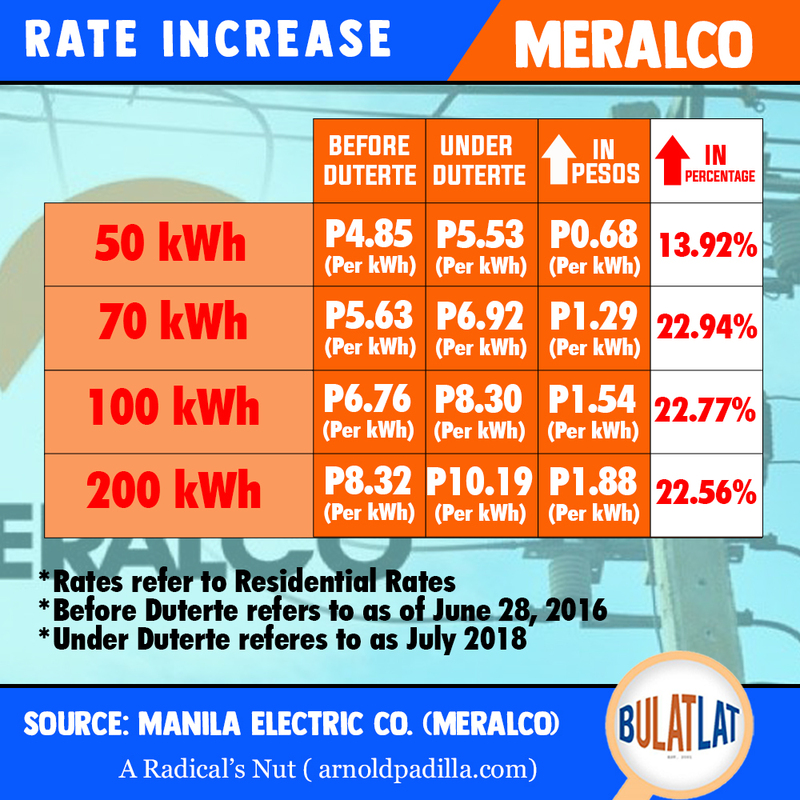 Residential rates charged to ordinary households by the Manila Electric Co. (Meralco) have jumped by 14 to 23 percent in the past two years. 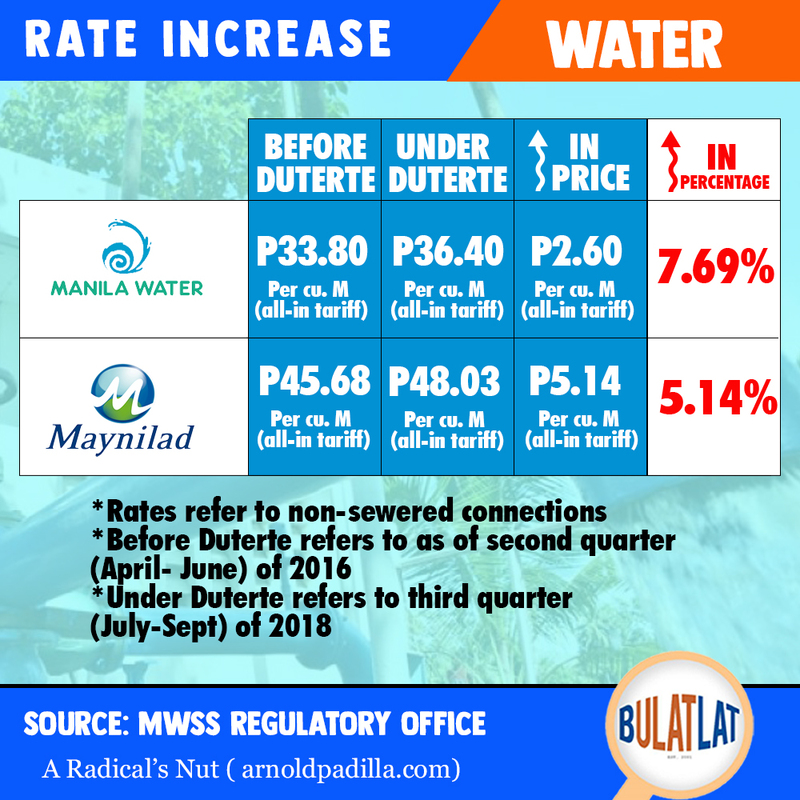 Water rates, on the other hand, are higher by five percent (Maynilad) to eight percent (Manila Water). The minimum fare in jeepney has also been hiked by an equivalent of 29 percent, and by nine percent (aircon) to 11 percent (regular) for buses. In addition, the flag down rate for taxis is 33 percent more expensive today. These significant increases in the prices of basic goods and services are captured by inflation rate data, which measure how fast prices are rising. 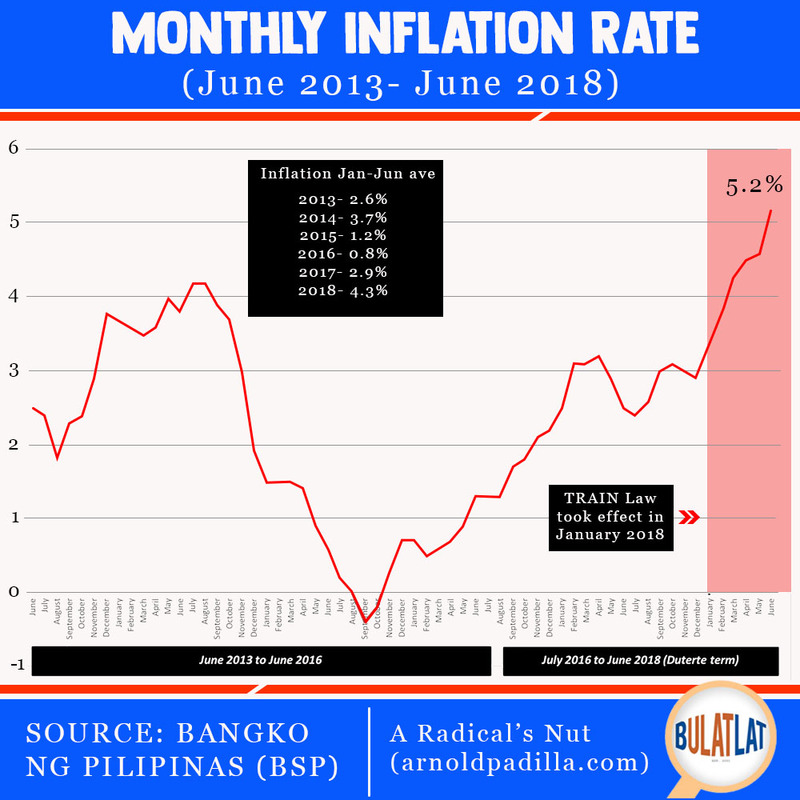 For six straight months this year, the inflation rate has been steadily accelerating and has already reached 5.2 percent in June, the highest in at least the last half decade. 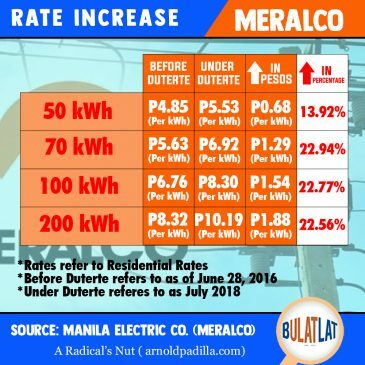 The rate of price increases today (January to June 2018 average inflation rate of 4.3%) is five times faster than it was during period immediately preceding Duterte’s term (January to June 2016 average inflation rate of 0.8%). 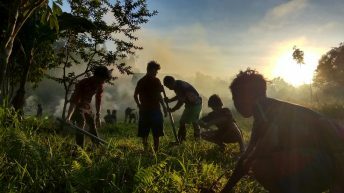 For most Filipino families, especially the poor and those in the lower income brackets, the rising costs of these basic needs mean tremendous pressure on household budgets. Also, the poorer the family, the larger they spend for food and to a certain degree for utilities (including housing) relative to their income as the latest Family Income and Expenditure Survey (FIES) of the Philippine Statistics Authority (PSA) shows. To illustrate, 60 percent of total expenditures of those with an annual income of less than P100,000 go to food compared to 35 percent for those with Php250,000 or more. What explains the rapid rise in prices especially in recent months? To deflect accountability, Duterte’s economic team points to global factors that are beyond the control of government such as the increasing world prices of oil and weakening peso against the US dollar (thus making imports more expensive). These economic managers are some of the country’s most rabid advocates of neoliberalism, a model of economic development that transfers control of economic factors from the government or public sector to the profit-driven market forces and private sector. These are in the form of liberalization, privatization, and deregulation as well as fiscal reforms to lessen state subsidies and increase tax collections. However, it is obvious that prices are climbing up because of the past neoliberal economic policies that the Duterte administration has chosen to continue and the new neoliberal programs that it has started to implement, chief among them the Tax Reform for Acceleration and Inclusion (TRAIN) Law. Implemented since January 2018, the TRAIN Law while lowering the personal income tax also introduced additional taxes for socially sensitive goods such as oil products, triggering a spike in inflation as shown in the chart above. Additional taxes on petroleum products under TRAIN aggravated the impact of the two-decade old Oil Deregulation Law which allows oil firms to automatically adjust pump prices every week. 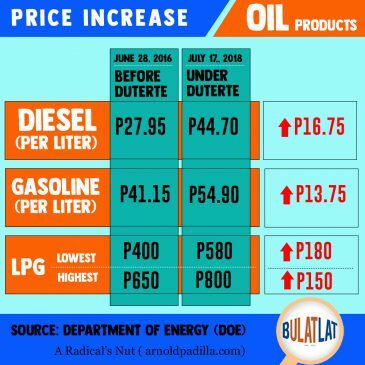 This year (up to July 17), oil prices have increased already by a total of P6.45 per liter for diesel; P6.00 for gasoline; and P6.70 for kerosene. TRAIN accounts for 30 percent of the total price hikes for diesel and 33 percent each for gasoline and kerosene. 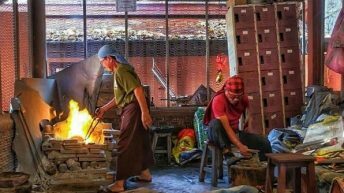 The bad news is that the prices of basic goods and services are not seen to ease anytime soon as the administration persists in its neoliberal direction. Duterte’s Cha-cha, for instance, is about neoliberalism in the economy as much as it is about federalism. When implemented, Cha-cha will pave the way for foreigners to take over and run, among others, the country’s public utilities that could result to even higher user fees for electricity, water, telecommunications and transport as these strategic sectors become further detached from national interest and public welfare. Cha-cha will also allow foreigners to own agricultural lands that could further undermine domestic food production and consequently the costs of food while poor farmers are further displaced from their means of production. Already, huge increases in water rates are looming again under Maynilad (seeking more than P11 per cubic meter hike in its basic charge) and Manila Water’s (P8.31 per cubic meter) privatization deal with the government that allows them to increase their basic charge every five years (on top of various periodic, automatic adjustments) and to pass on questionable charges to consumers, most notably their corporate income tax. LRT-1 fares could also jump by P5-7 as part of government’s privatization contract with the consortium of the Ayala family and Manny Pangilinan’s group that allows them to hike their basic fare every two years. And lest the public – still reeling from the impact of the first wave of increases under the TRAIN Law – forgets, more tax hikes (and consequently, spikes in consumer prices) are coming under Duterte’s tax reform program. The TRAIN law mandates that the excise tax for diesel, pegged this year at P2.50 per liter, will climb to P4.50 in 2019 and further to P6 in 2020. For gasoline excise tax, the schedule is P7 this year, and then P9 and P10 in 2019 and 2020, respectively. It certainly does not help that the public’s legitimate concern on skyrocketing prices is being met with apathy by the chief architects of Duterte’s flawed neoliberal economic program such as Budget Secretary Benjamin Diokno’s crybaby remark. Unconditional cash transfer and Pantawid Pasada diesel subsidy for jeepney drivers to mitigate the TRAIN, aside from already delayed, are band aid solutions that will not reverse the long-term impact of high prices. 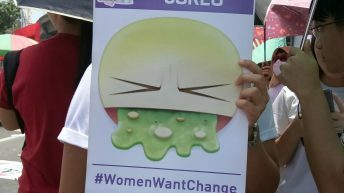 The wanton killings under Duterte and his repulsive tirades have sparked public outrage and the people’s protests are spreading. The unabated increases in prices and the cost of living will only add fuel to the fire.